Since our release of the iOS and Android apps in September, we have been busy working toward the next big release of our mobile payment apps in the New Year. Functionally, we’re completely redesigning the user-interface and navigation in the application, improved performance, added some cool new features, and focused quite a bit on ensuring that collecting payments is quicker and easier than ever. Visually, we’re giving the mobile app a big facelift (See left). 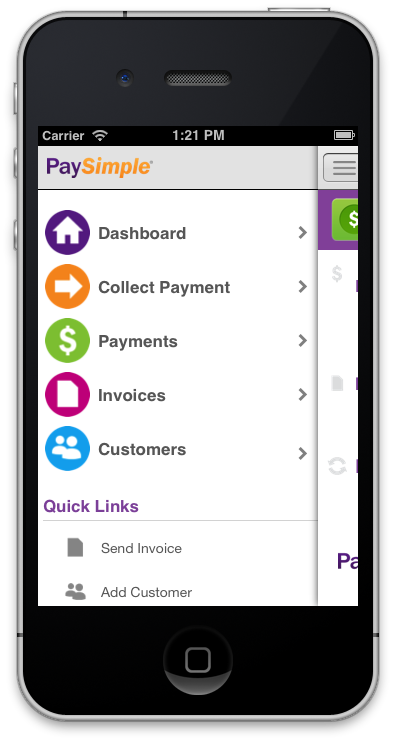 We’re adding a dashboard that provides a quick snapshot of deposit, payment, and invoice information. We’re also implementing map support so you can visualize customer addresses, and support the iPhone’s retina display with crisp and colorful icons and images. Mobile payments are the future of customer convenience. According to the 2011 Billing Household Survey, customers are using multiple channels to pay their bills, with nearly 20 percent of customers changing their payment technique every month. The top two reasons for changing were availability of funds (63 percent) and billing due dates (54 percent). But mobile payment technology is still a new concept for most small businesses, as the survey also found that only 12 percent of small businesses currently offer a mobile payment option to their clients. This gap presents a major opportunity for those businesses to gain a critical advantage on their competition, which is why empowering our clients with fast, simple, convenient payment processing technology has been the central focus of our mobile app development efforts. As always, we appreciate your feedback on comments on what you’d like to see in our mobile apps. We have a dedicated mobile team that is working hard to bring the power of the PaySimple platform into the palm of your hand.